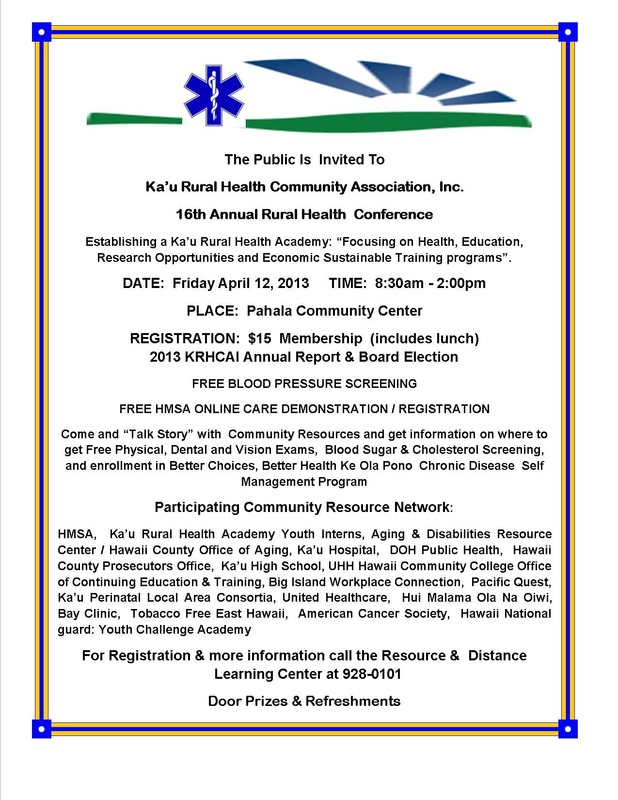 Events « Ka'u Rural Health Community Association, Inc.
help you get ready for the Health Insurance Marketplace. a small business, we’ll help you find a plan that works for you and your employees. Self employed? We’ve got that covered too. This entry was posted in Education, Events, Health & Wellness, News, Opportunities. 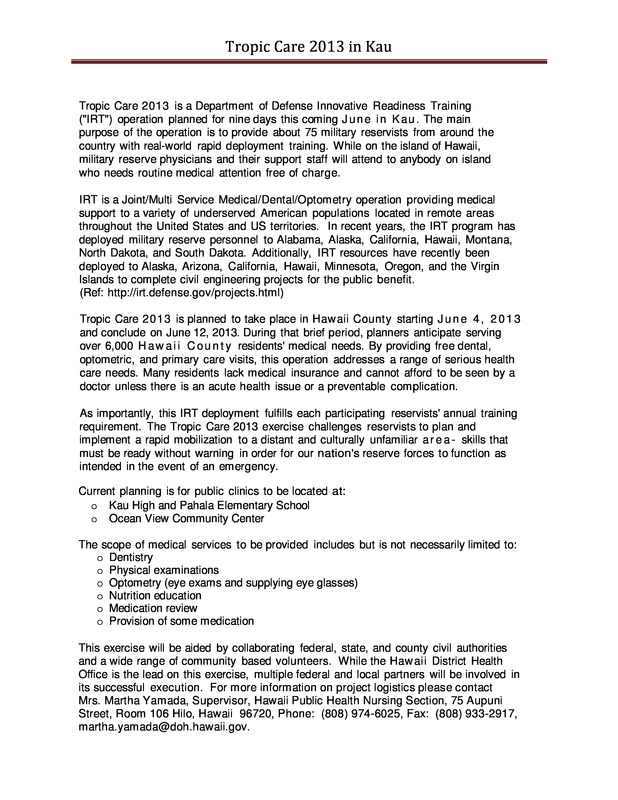 An innovative training program by the U.S. Department of Defense will bring 75 military reservists to Ka‘ū June 4-12 to provide free medical care in clinics open to the public.Tropic Care 2013 will run two clinics, at Ka‘ū High & Pāhala Elementary School and the Ocean View Community Center. Clinics will be open from 8 a.m. to 4 p.m., closing early at 12 p.m. on the final day, June 12. Health care services that will be provided free of charge include physical exams, dentistry, optometry (exams and glasses), medication review and provision of some medication, and nutrition education. Patients will be seen on a first come, first served basis and are advised that there may be long wait times. Tropic Care 2013 is a partnership between the U.S. Department of Defense and the state Hawai‘i District Health Office, supported by the County of Hawai‘i and the Ka‘ū Rural Health Community Association. It is an exercise of the Department of Defense’s Innovative Readiness Training program, which challenges reservists to plan and implement rapid mobilizations to distant and unfamiliar areas. Other community partners collaborating to bring this service to Ka‘ū are: the Hawai‘i Department of Education, Ocean View Family Health Center, Hui Mālama Ola Nā ‘Ōiwi, Bay Clinic, Hawai‘i Island Cardiovascular, Hawai‘i Island Community Lung Assessment Science Studies, Ocean View Community Association, Kona Community Hospital, Hawai‘i Police Department, Hawai‘i National Guard’s Youth Challenge Academy, Ka‘ū Hospital, Pacific Quest, and the Veteran’s Administration. 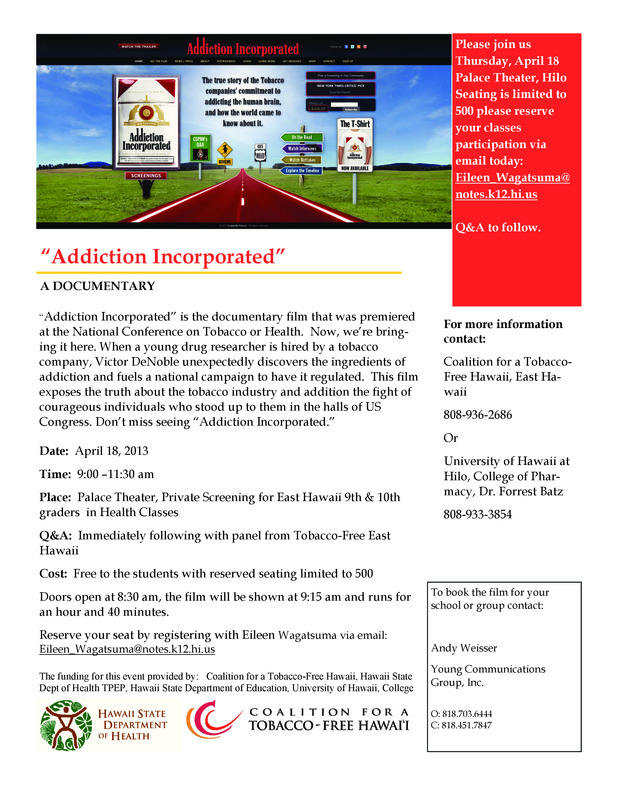 For more information on Tropic Care 2013 or to request special assistance or an auxiliary aid seven days prior to the event, call (808) 974-6035 or email Martha Yamada of the Public Health Nursing Section at martha.yamada@doh.hawaii.gov. To view the Hawaii County link to this information, please click here. This entry was posted in Events, Health & Wellness, News, Opportunities, Partnerships & Programs. Parking Information: TBA. HSCADV does not reimburse for the cost of parking. 3) have completed a 25 hour domestic violence training. This training is a four-day interactive experience featuring information that will create a foundation to understand the issue of domestic violence. Each of the days includes topic-specific modules. Participants may register for individual days, up to all four days of training; however, the first day of training requires attendance as it covers the dynamics of domestic violence and is the foundation for the following days of training. Please not that registration for each day denotes commitment to attend the entire day. Training Fees: Flat fee per person (regardless of # of days of training): $25 for member program staff, $100 for non-member programs/general public (scholarships are available for half price for non-members if cost is an issue). One hour break for lunch is provided each day. Lunch, snacks & drinks are on your own and can be purchased at any number of places in the area. Participants are required to maintain their documentation of completion as HSCADV does not keep attendance records. All participants who complete this training will receive a comprehensive resource manual that includes information on the above topics and other related information and a certificate for each day of attendance. This entry was posted in Education, Events, Health & Wellness, Opportunities. This entry was posted in Education, Events, Health & Wellness, Partnerships & Programs. This entry was posted in Education, Events, Health & Wellness. Click here for more information on the prison monologues. Make sure you get email messages from Ho ‘owaiwai Network. Add info@assetshawaii.org to your approved senders list. This email was sent to: krhcai@yahoo.com. Click here to unsubscribe. Copyright © 2012 Assets Hawaii. All Rights Reserved. This entry was posted in Events, Partnerships & Programs.